There’s something quite exciting about purchasing from indie retailers, when a product isn’t mass-produced and picked from the supermarket shelves you can feel a greater connection with it somehow. The owner of Marshmallow Blends, Nicoletta is also a beauty blogger… so if anyone knows what we want for our bathtime treats, she’d be pretty high up the list! A few weeks ago, she sent me a few bits* from her store and today, I’m sharing my two favourites with you. One in particular, is a knockout and will be a repurchase. I’ll even let her hold me to that! 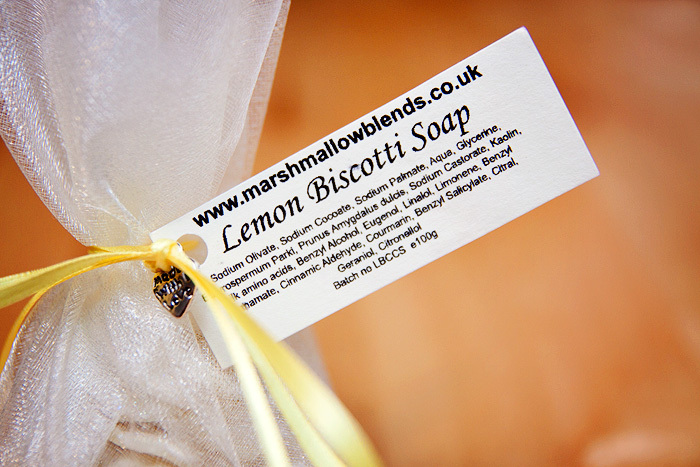 First up is Marshmallow Blend’s Lemon Biscotti Cupcake Soap (£4.50) which looks as much like a traditional bar of soap as I do, Kate Moss. 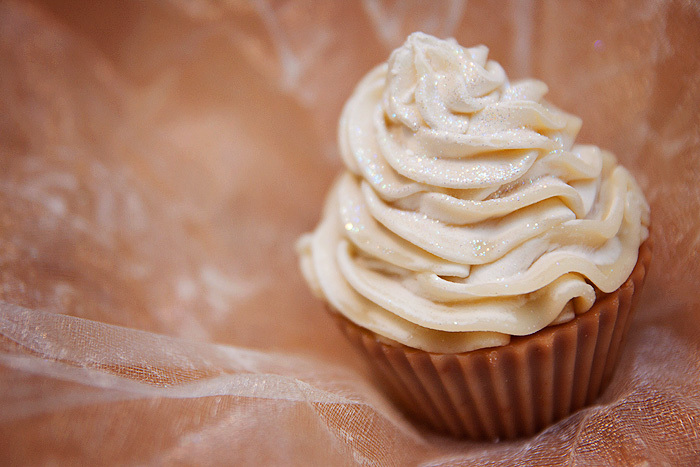 In it’s ridiculously cute, not-entirely-practical (but who cares) form of a cupcake, it would appeal to most everyone with a sweet tooth. My daughter adores it and has claimed it as her own. It has a slight dusting of glitter on-top which I thought might be a bit of a pain in the backside but thankfully disperses after the first use. The lather is rich and the scent, divine. It’s not a lively, lemony aroma but a warmed up, fresh from the oven scent with more than a passing nod to some rather-cakey almond smells, not unlike a quitened frangipane! You can see that the packaging is perfect for gifting and I don’t know a single girl who wouldn’t consider this a lovely gift to receive. Would be utterly perfect for end-of-year teacher’s presents actually. I’m a bit funny about scrubs, a little bit squeamish if you will… I don’t very much like the sensation of putting my hand into a pot of sugary/salty goo and scooping out a hand-full. It’s a messy business as you try to juggle the contents of your palm under the shower as the “goo” slips between your fingers and down the plughole before you’ve even gotten it near your body. Then you’re left digging out granules from under your nails while the water runs cold. You get the picture. 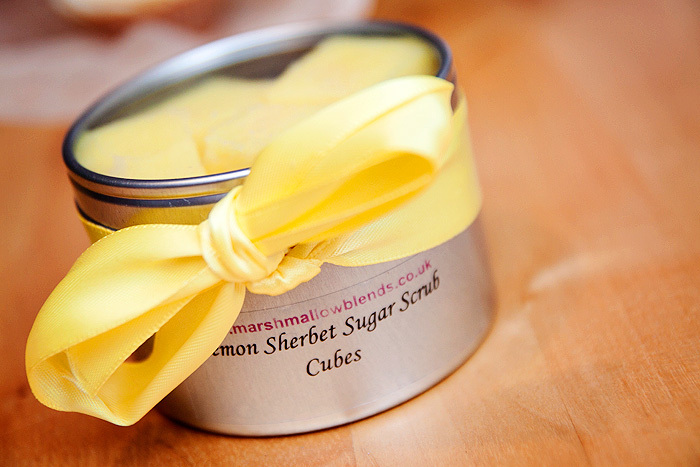 Marshmallow Blend’s Lemon Sherbet Sugar Scrub Cubes (£6) is one of the best lemon-scented body-care products I’ve ever encountered. If you like The Body Shop’s lemon range (which is also a nice interpretation of the scent), I implore you to try these. As a body scrub, they’re pretty much perfect. They hold their shape when you run a cube over your limbs, softening under the warmth of your touch without giving up completely! The scent is super-uplifting and zingy without being artificial, it’s a true “happy” scent that goes a very long way to improving your mood on a Monday morning. 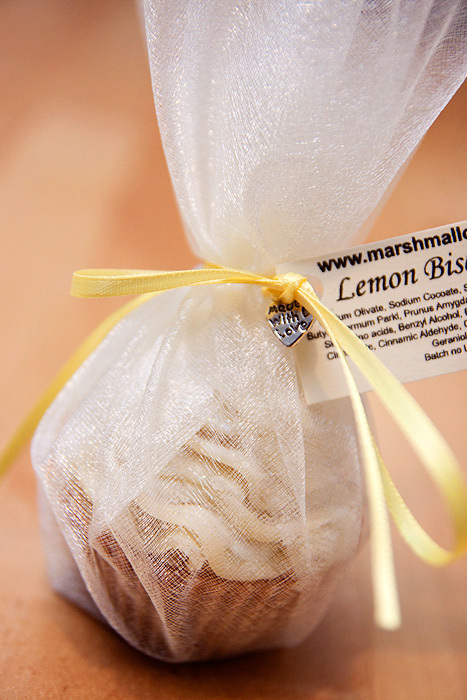 I would love to see Marshmallow Blends offer these cubes in more scents. On the subject of scents, most of the “flavours” available on the website lean towards the gourmand… it would be good to see a little more diversity, less cream more earthiness please! I expected Nicoletta’s creations to be nice-enough but I’m pleasantly surprised by just how good and (for want of a better word), robust these offerings are. I’m obsessed with gourmandy soups and usually end up ordering from the states via etsy, which has been a pain since the postal rates went up. I think I know what my pay day treat will be this month! I have only ever ordered from Nicoletta once, mainly because everything has lasted for ages as you don’t need much compared to high street stores! A favourite of mine are the shower fluffs, cherry smells amazing and the scent lasts forever! Service is also incredibly personal as well and she is always on her Facebook page for questions about the products. Also try the lip butters, delicious! The body butters are nice, but definitely ones for sleeping in instead of applying in the morning! 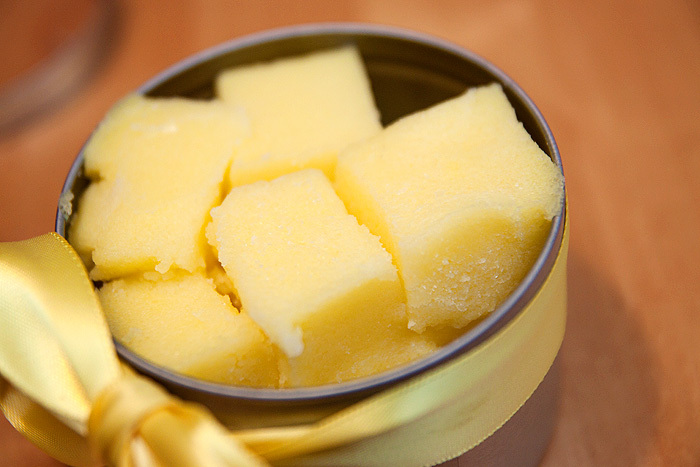 These scrub cubes are also great for hands before a mani. I’m really happy that Nicoletta has become so successful, she’s a real inspiration! Wow!!! they sound so yummy. I am very curious on these products. they seem great products to try out based on your reviews and people’s comments. I’ll def check on these products. Does she ship to the United States? I’m sorry, looking at the shopping cart… I don’t think she does.